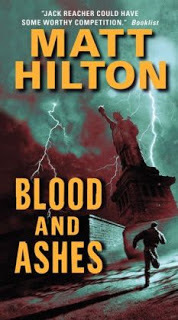 Blood and Ashes - Joe Hunter 5 - is now on general release in paperback in the USA, published by William Morrow and Co (Harper Collins). I really love the pulpy new cover - what do you think? How does one man stay alive with a dozen assassins targeting him? Ex-soldier Joe Hunter once employed his killer instincts for Don Griffiths. Together, they brought down extremist groups and domestic terrorists before they could implement their destructive plans against the country. It was a job that nearly cost Hunter his life—and his humanity. So he severed all ties with Griffiths. But when Griffiths' daughter is murdered and the rest of his family is targeted by supporters of Carswell Hicks, an enemy from his past and long believed to be dead, Hunter knows he can't stand by and let innocent people get hurt. Agreeing to help Griffiths protect his family, Hunter sets out on a suicide mission—for a dozen merciless killers are bent on avenging a dead man . . .
Any word on 6, 7, and 8? Time to crack the whip on your publisher. Number 6 - Dead Men's Harvest - will be out in the USA later this year on OCtober 29th, so not long to wait. There was a different publishing schedule between my UK and US publishers. The UK were doing 2 per year - hence we got ahead - but with book 8 have gone to 1 a year. The US was doing 1 a year until 3 + 4 came out (then republished 2) and are now on catch up. Won't be long before the deficit is sorted, I hope. Good to hear. I assume they'll have ebook versions, too? Yeah, they should all be available on ebook. Are you also aware of the short Joe Hunter ebook exclusives available? Dead Fall and Red Stripes. They're short stories but might satisfy while waiting the next full length hunter book.